Toe pain and forefoot pain can stop you from going about your day-to-day routine. 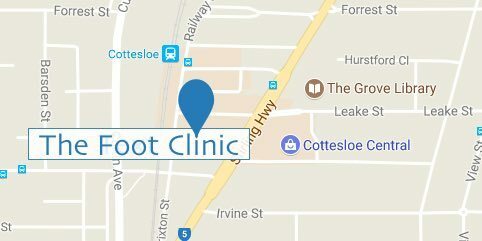 Our team of podiatrists at The Foot Clinic will give you a clear diagnosis, and recommendations for the right treatment plan. Your toe pain can come with numbness in areas of your foot, or you may experience swelling or tingling. As soon as you feel any of these symptoms, or toe pain that stops you from moving normally, we recommend you see your podiatrist at The Foot Clinic. A bunion is a deformity of the big toe, and this lump can cause severe toe pain because it makes bone and tissue move out of place. The bunion changes the way you move your foot, and it creates additional pressure in your shoes. As a result, your big toe will start bending towards the other toes. Bunions come with symptoms such as swelling of the toe joint, soreness, redness and you will feel that you can’t move as you normally would. Bunions occur partly because of genetic factors, but wearing narrow footwear is also a known trigger for this type of toe pain. It’s important to see your podiatrist and assess the condition, to avoid more severe problems like bursitis, calluses, arthritis or hammer toes down the track. We see patients having different degrees of skin and nail problems with their feet. From ingrown toenails to needing to examine the biomechanics of their feet, we can help. Bio-mechanical Assessment of your body means we assess the bio-mechanics; how your body, and the different parts, move in relation to each other and the ground they are supported by. Morton’s Neuroma causes toe pain and forefoot pain, and it means that a nerve is compressed and expanded. Again, narrow shoes can be one of the causes, and they would cause pain between your third and your fourth toe. 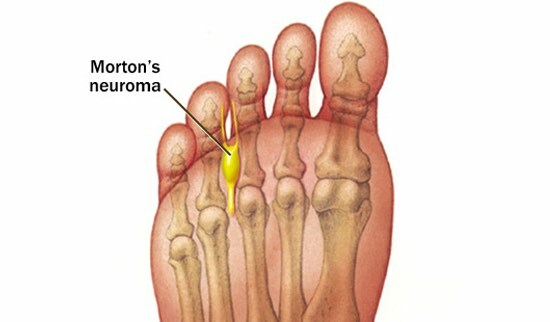 If you have had other foot problems, such as bunions, flat feet or hammer toes, then you may have a higher risk of developing Morton’s Neuroma. Your risk is also higher if you run a lot. Typical symptoms – apart from the toe pain – are tingling or numbness. It’s recommended to talk to your podiatrist at The Foot Clinic to get a clear diagnosis, and to define the right treatment plan. Toe pain can be caused by hammer toes or claw toes, and they can be painful conditions. With hammer toes, the joints in your second, third or fourth toes have an abnormal bend. The joints start forming a hammer (or a claw) with the toe, because the tissue around the joints is out of balance. Muscles, ligaments and tendons are no longer doing their normal work, which is to keep your toe straight. This is another type of toe pain which may be caused by wearing shoes that are too tight. The condition is more common in women than in men, and the risk increases with age. Hammer toes can also be caused by genetic factors, by a fracture, arthritis or diabetes. At The Foot Clinic, we have several treatments available for this type of forefoot and toe pain. Inflamed “Sesamoid bones” are another cause of toe pain. They are two small bones under your big toe joint. The Sesamoid bones help your muscles, softening the friction in your forefoot when you walk. When all goes well, they take care of the pressure with every step we take. But if they are injured or overused, they can become inflamed (Sesamoiditis). It is important to see your podiatrist straight away, to avoid a fracture in the Sesamoid bones if you leave the condition untreated. Typical symptoms are swelling at the bottom of your forefoot, and constant pain around the big toe, or pain when you move your big toe joint. What to do about toe pain? If you experience toe pain, it will influence your ability to walk. And because of the pain, you may start shifting your weight on other parts of your feet, causing other problems in that area, or even higher in your legs and hips. This is why early detection, and an assessment by your podiatrist, is essential to avoid further foot problems down the track. At The Foot Clinic our priority is to give you a clear diagnosis and to reduce pain and inflammation. Then we work out a personalised treatment plan, including advice on making the best lifestyle choices to avoid the problem in the future. At The Foot Clinic, we are passionate about helping you with toe pain and any other foot problem. We strongly believe in building better bodies from the feet up, because in our bodies, everything is connected. The bio-mechanical function of our feet, legs, knees and hips, is an essential aspect of our mobility and our quality of life. And at The Foot Clinic, we pride ourselves in helping people get back to an improved mobility. Whether your goal is to walk around the house or in the park or to prepare for the next marathon. So contact The Foot Clinic today to fix your toe pain!